Monday was a good day for Singapore in sailing, with great successes attained by her young competitive sailors at the 2011 Optimist World Championships in New Zealand. 15-year-old Kimberly Lim clinched the Overall world champion title in the individual races, skimming to victory by a narrow four-point margin over her Dutch competitor. Her win meant that she also emerged the Individual Girls' world champion in the competition, adding a third notch to her belt following an Asian championship title she attained at the OCBC IODA Asian Optimist Championship in July last year. 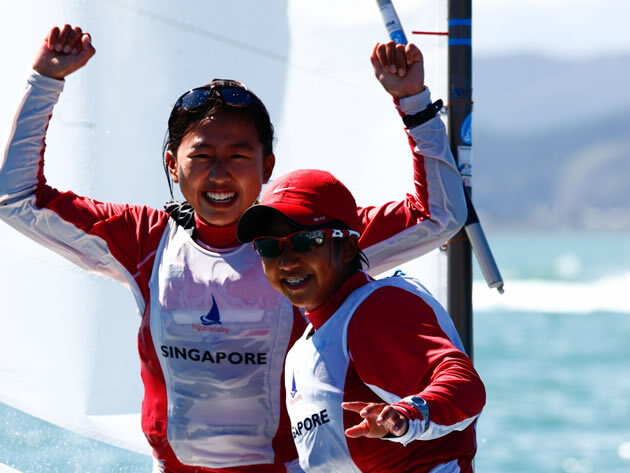 Together with her teammates, Lim also contributed to Singapore winning the World Team Racing title as well as the Nations Cup, adding to the nation's best-ever showing at the annual regatta, having made a clean sweep of the world titles on offer. The sole male sailor in the team, 14-year-old Ryan Lo, finished in fourth place overall, while their teammates Elisa Yukie Yokoyama, Jessica Goh, both 14, and 15-year-old Jillian Lee finished 23rd, 52nd and 38th respectively out of some 210 sailors altogether. Singapore's positive performance in this year's regatta follows their strong showing at the 26th Southeast Asian Games in Jakarta last year, hauling home four gold, one silver and three bronze medals. The titles attained add up to some 16 world titles won for the Republic since 2004, although none of these are Olympic-class wins yet -- but Singapore Sailing Federation president Ben Tan is optimistic about the country's prospects. "The talent emerging consistently from our junior programmes will augur well for SingaporeSailing's push towards 2016 and 2020 Olympics, and beyond," he said.